9/24/2015Share this story on Facebook! 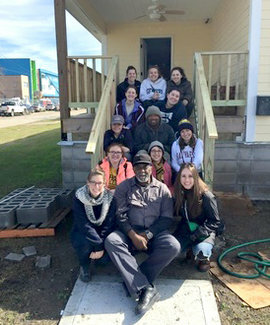 A group of Park scholars sit with local residents on the steps of a home they were helping to restore in New Orleans during winter break. Mia O’Brien ’15 was part of a group of senior Park scholars who went on a service trip to New Orleans over winter break. The students met many local residents who had unique insights into the problems facing the area. One evening, O’Brien was taking a taxi and became captivated by the stories the driver was telling. “The idea popped into my head to profile each [storyteller] through a project similar to the Humans of New York campaign,” she said. The Park scholars used these portraits as a springboard to discuss topics such as “voluntourism,” home ownership, and institutionalized racism in post-Katrina New Orleans, 10 years after the hurricane hit. They created a website, called Humans of NOLA, where they posted these stories. The Park scholars also shared them at the Whalen Symposium. Stories uncovered by the Park scholars indicated that many of the homes damaged by Katrina were in designated historic districts, which retained strict, often very cost prohibitive, guidelines about how construction work had to be done. Also, housing owned in historically black neighborhoods in the lower-lying sections of the city were hit hardest by the storm and were less likely to be rebuilt.